Get ready to rock the night away and usher in 2019… New Year’s is almost here! Connecticut restaurants and bars are celebrating with gourmet meals and epic bashes to help you start the new year out right. Here is a complete guide to 60+ places where you can dine in style and watch the ball drop. 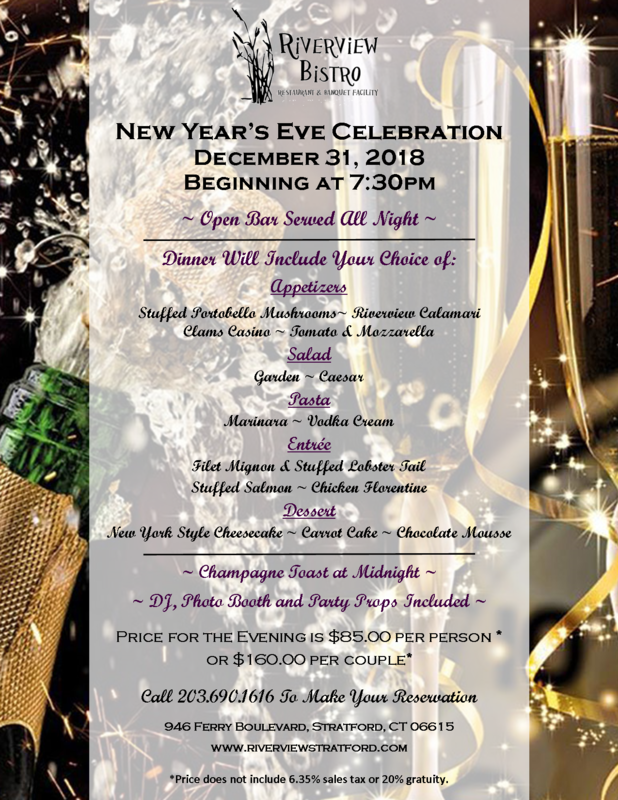 The Spread, Greenwich & Norwalk: For NYE, The Spread in Norwalk will host a Black & White Ball while the Greenwich location hosts a Masquerade Ball. They will both be closed on New Year's Day. Griswold Inn, Essex: The chefs at the Griswold Inn have created an 3 course menu for $60 per person. Dinner seatings begin at 5:30pm and guests can listen to piano in the Tap Room from 5:30-8:30pm. End the evening by dancing into 2019. J House, Greenwich: J House in Greenwich has 2 NYE seatings: 5-8pm and 9pm-12am. Choose from dinner options or an open bar package. Jesup Hall, Westport: Jesup Hall in Westport will serve New Year’s Eve @jesuphallwestport dinner from 5-10:30pm and a "#happytime menu" until midnight. Call 203-557-6198 to reserve. Bar Sugo, Norwalk: Bar Sugo will be open on both New Year's Eve and New Year's Day. On 12/31, dine on their regular menu along with holiday specials. On 1/1, they'll offering brunch from 11:30am-3pm and dinner from 3-9pm. Oyster Club, Mystic: The Oyster Club in Mystic celebrates "Nordic New Year" from 4pm-9pm on 12/31. The Melting Pot, Darien: At the Melting Pot in Darien, enjoy a 4-Course NYE Fondue Meal including a charcuterie board, party favors, and a Champagne toast. Vegetarian, children's, and non-alcoholic options available. Millwrights, Simsbury: Millwrights offers 2 NYE seatings. From 5-6:30pm feast on 4 courses for $94 and from 7-10pm get 6 courses for $124. The Gingerman, Greenwich: At the Gingerman in Greenwich, Chef Carl is creating an NYE menu. After that, a Late Night Party takes over with a DJ, dancing, party favors, and champagne toast. Cask Republic, Stamford: Cask Republic Stamford will have 2 NYE seatings. Early Birds can enjoy a 3 course prix-fix from 4-7pm for $40. The "Prime Time" option runs from 7-10pm and includes 3 courses for $75. Evarito’s, Norwalk: At Evarito's in Norwalk, $35 gets you a late night buffet starting at 9:30pm, your first 2 drinks, a midnight toast, a DJ, party favors, and more. Bernard’s, Ridgefield: New Year’s Eve @ Bernard's Monday, December 31 Bernard’s in Ridgefield will have 2 seatings. The 6pm is a 4 course meal with pianist Hank Milligan for $105 per person. The 9pm is $185 per person and features a 5 Course meal with the Maria Tiscia Quartet, Dancing, and a Champagne Toast at Midnight. Kashi, Stamford: At Kashi, ring in 2019 with live music, an open bar, and a dinner buffet. It costs $90 per person. Geronimo Tequila Bar & Southwest Grill, Fairfield & New Haven: Geronimo Tequila Bar & Southwest Grill will be open New Year’s Eve from 11:30am-1am offering their regular a la carte menu as well as specials. Please note that the kitchen closes at 11pm. Our House, Norwalk: At Our House in SoNo, enjoy passed hors d'oeuvres and cocktails from 6-7pm, get a $25 2-hour Cocktail Bracelet from 7-9pm, and pre-purchase a $50 Bracelet for cocktails, an International Buffet, and VIP access after that. Saltwater, Norwalk: Saltwater SoNo's NYE fun starts at 4pm. Join them for dinner and drink specials. Basso Café, Norwalk: Basso Café will have an a la carte menu, Chef specials, and live music from The Red Hots. A $20 Cover includes a glass of sparkling. Make your reservation today! Peaches, Norwalk: Peaches will have NYE fun on all of its floors! The 1st floor will offer an a la carte menu and glass of bubbly with seatings at 5, 7, and 9pm. Head to the second floor for a Juke Joint Party. Washington Prime, Norwalk: Travel back in time to the Roaring 20s at Washington Prime's "Prohibition New Year's Eve." There are two seatings available- costumes required! Bourbon Raw, Norwalk: Join Bourbon Raw in Norwalk for "A Night at the Speakeasy" on NYE. Packages start at $75 per couple. Cantiki Taco Deck, Norwalk: A luau for NYE?! You bet at Cantiki Taco Deck in Norwalk. Tickets starting at $75 and include an open bar, pig roast, buffet, Polynesian dancers, and DJ. Blind Rhino, Norwalk:The Blind Rhino in South Norwalk will be hosting their 3rd annual Ball Drop on New Year's Eve. A $10 cover charge, includes a champagne toast at midnight, entertainment provided two DJ’s, and drink specials. Mohegan Sun: In addition to specials across the casino, Mohegan Sun is hosting its own epic NYE bash. Kicking off at 10:30pm, party with dancing and music by DJ Crooked & DJ Neva from SKAM ARTIST, an open bar, champagne toast and 12:15am breakfast buffet! Bar Americain, Mohegan Sun: Bar Americain in Mohegan Sun is extending its hours so that guests can enjoy a special 3-Course meal for $150. Tuscany, Mohegan Sun: In honor of NYE, Mohegan Sun's Tuscany is serving up an 18 oz. Bone-in Ribeye for $75. It is served with butter poached Alaskan king crab, silk potato, petit asparagus, and Béarnaise sauce. Harlan Publick, South Norwalk: Chef Buffet for $45 plus cash bar with 1/2 priced cocktails all night long! Milestone, Georgetown: Milestone Restaurant will be open New Years Eve and in addition to their regular menu, they will have live entertainment and a champagne toast at midnight. Two Steps Downtown Grille, Danbury: Norwalk's Troupe 429 hosts a New Year's Eve pajama party from 8pm-2am. Café on the Green, Danbury: Café on the Green in Danbury is celebrating both New Year's Eve and New Year's Day. They'll serve a 5 course prix fixe menu on NYE and brunch on New Year's Day. Bradford’s Grill & Tavern, Stamford: Bradford’s Grill is starting NYE at 9pm with $5 Jameson shots, $5 Crown Royal or Captain Morgan’s Spiced Apple Ciders, and a DJ. There will also be a Champagne toast at midnight. Coalhouse Pizza, Stamford: Coalhouse Pizza invites you to ring in 2019 with a full BBQ buffet, unlimited wings and pizza, specialty beers, prizes, and more. Tickets are $60 now and $75 at the door. Tiernan, Stamford: Tiernan in downtown Stamford will have an NYE party on 12/31. Sign on the Whale, Stamford: The NYE party at Sign of the Whale will include passed Hors D’oeuvres, a top shelf open bar, a DJ, and a champaign toast at midnight. Tickets start at $125. Brother Jimmy’s BBQ, Stamford & New Haven: At Brother Jimmy's, partake in an premium open bar, dinner buffet, continental breakfast, and a champagne toast at midnight. L’escale, Greenwich: L'escale presents a New Year's Eve Gala. The first seating features an a la carte menu while the second seating lasts from 8-10pm and has a 5 course prix fixe menu. Enjoy a live band with dancing! Artisan, Southport & West Hartford: Artisan in Southport will have 2 New Year's Eve seating. The first is $85 per person while the second is $145 per person and includes both dining and dancing into 2019. Riverview Bistro, Stratford: Riverview Bistro in Stratford celebrates NYE with a 5 course prix fixe dinner and an open bar ALL night. There will even be a DJ, champagne toast, and party favors. It is $85 per person or $160 per couple. The Hops Company, Derby: The Hops Company in Derby invites you to their 2nd Annual NYE party. A $25 cover includes a live DJ and a free drink. 21+ only. Barcade, New Haven:On New Year's Eve, Barcade in New Haven is waiving the cover charge so that guests can enjoy a champagne toast and special tap list. Long Ridge Tavern, Stamford: Long Ridge Tavern in Stamford will have a 3 course prix fixe NYE menu for $75 per person, plus tax and tip. Aspen, Old Saybrook: Aspen in Old Saybrook is preparing a NYE menu with specials like Seared Sea Scallops, Harissa Rubbed Chicken, Grilled Lobster, Bison Strip Loin, and more. Harbor Lights, Norwalk: Harbor Lights in Norwalk presents a special NYE menu on 12/31. Fresh Salt @ Saybrook Point, Saybrook: Fresh Salt at the Saybrook Point Inn will have a New Year's Day Brunch from 10am-3pm. Start 2019 with baked goods, waffles, omelets, pasta, carving stations, and dessert. Copper Beach Inn, Ivoryton: Join The Copper Beach Inn for a spectacular evening of dining and music featuring a custom a la carte menu with "best of the best" selections. elm, New Canaan: or NYE, elm in New Canaan is offering a prix fixe menu featuring signature dishes alongside comforting holiday classics by Chef Luke Venner. It is $95 per person and $35 per child under the age of 12. Mystic Aquarium, Mystic: Usher in the New Year enjoying the classic elegance of the Black and White Ball at Mystic Aquarium. Guests will savor Ocean Blue Catering’s gourmet food stations, get complimentary drink vouchers, and listen to live entertainment by The Boston Premier Band. High Rollers, Foxwoods: Bowling meets NYE antics at High Rollers in Foxwoods. Tickets include champagne toast, music by DJ John Cardona, and all of the fun the lane meets lounge has to offer. Bar Zepoli, Stamford: Stamford's Bar Zepoli will have 2 NYE seatings. Dine on their 5-course prix-fixe menu for $125 or add on a champagne toast for $150. Bedford Hall, Stamford:On 12/31, Bedford Hall in Stamford will celebrate with a live DJ all night and special menu. Harlan Social, Stamford: Celebrate New Years Eve at Harlan Social in Stamford with live music from the band “Last Call," a buffet buffet, and cash bar with drink specials all night long. It is $55 per person. Water’s Edge @ Giovanni’s, Darien: On 12/31, the Water' Edge in Westbrook will offer 2 early bird seatings, 5pm and 5:30pm, for a 4 course prix fixe dinner and toast. From 7pm-1am, they'll have a festive Dinner and Dance Party. Tigin, Stamford: Tigin in Stamford starts the NYE festivities at 7pm to celebrate 2019 in Ireland! At 8pm, a $10 cover gets you access to dinner and drink specials, live music, a champagne toast, NYE party favors, and more. Water’s Edge, Westbrook: On 12/31, the Water' Edge in Westbrook will offer 2 early bird seatings, 5pm and 5:30pm, for a 4 course prix fixe dinner and toast. From 7pm-1am, they'll have a festive Dinner and Dance Party. Troupe 429, Norwalk: Norwalk's Troupe 429 hosts a New Year's Eve pajama party from 8pm-2am. Outriggers, Stratford: Outriggers will have a special NYE menu. Catch them before they temporarily close for the month of January! The Cottage, Westport: The Cottage will be open New Year’s Eve from 5:30pm-10:30pm, offering holiday specials on the a la carte menu. OKO, Westport: OKO will be open New Year’s Eve from 5:00-10:30pm, offering a number of sushi and kitchen specials to the a la carte menu. The Stack, New Haven: The Stack, featuring Bear’s Smokehouse BBQ, will be open New Year’s Eve from 11am-1am, offering beer, wine and cocktail specials along with live music. Beginning at 6pm, parties of 6 or more can reserve a BBQ Stack Tower, feature three tiers of smoked wings, moink balls, chicken sliders, chopped meat sliders, 1.5 lbs beer brats w. mustard & pickles, a custom Brisket Fat Bavarian soft pretzel as well as a giant pile of hand-cut BBQ dusted fries ($140 not including tax or gratuity). In addition to the meat tower, parties will have a reserved table for the evening, a bubbly toast and party decorations. Guilford Mooring, Guilford: Guilford Mooring will be open New Year’s Eve from 11am-9pm, offering their regular a la carte menu as well as specials beginning at 3pm. The restaurant will also be offering 50% off bottles of wine, champagne and prosecco to help celebrate the end of 2018! Bistro V, Greenwich: Bistro V will be open New Year’s Eve from 7am-10pm, offering their regular a la carte menu, as well as specials beginning at 5pm. Giovanni's, Darien: Choose an appetizer, entree, and dessert for $75. Your NYE meal also includes a champagne toast. Add-ons are available.